Yesterday, the President implored Saudi Arabia to produce more oil. That is, he told the Saudis to “drill, baby, drill.” He did the same thing a month ago in Brazil. Meanwhile, U.S. production remains stunted by the Obama administration’s de facto moratorium on new oil and gas leases and permits. Why is “drill, baby, drill” appropriate for Saudi Arabia and Brazil, but not for the U.S.? 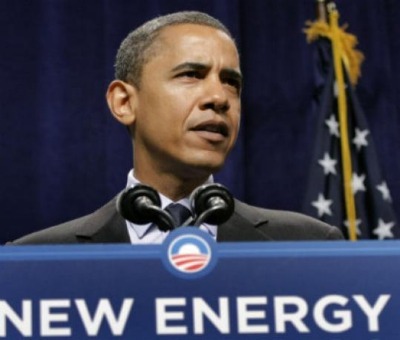 Last Saturday, the President called for an end to tax breaks for the oil industry. He said, “They’re making record profits and you’re paying near record prices at the pump. It has to stop.” So, the President wants to end oil “subsidies” in order to relieve Americans pain at the pump. This doesn’t make any sense, because the effect of oil industry “subsidies” is to lower the price of oil. It’s a market distortion meant to lower the cost of producing oil. By removing these “subsidies,” the price of oil would better reflect the forces of supply and demand, and it would increase. The President wants to take away oil industry “subsidies,” and turn them into green energy giveaways, because, he says, this will “reduce our dependence on foreign oil.” For starters, it’s unclear how investments in unreliable, expensive electricity produced by wind and solar would “reduce our dependence on foreign oil.” Moreover, in the past, Obama’s has dismissed “drill, baby, drill” on the grounds that it would take years to impact the global oil market. The President claims that expanded oil production would take too long to have an effect on the price of gas, but that increased taxpayer handouts to wind and solar would somehow “reduce our dependence on foreign oil” in a more reasonable time frame. This is nonsensical.